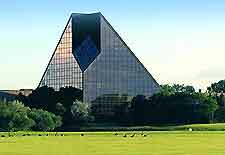 Centuries before the first European fort was established in present day Winnipeg, in 1738, the city's current location at the intersection of the Red and Assiniboine rivers, was already an important trading post for its surrounding First Nations farming tribes. Decades before the British founded the Hudson's Bay Company, the French officer Sieur de La Vérendrye established the Fort Rouge fur trading post near Winnipeg in 1738. The Ojibway helped the first European fur traders navigate this flat prairie region with birch bark maps. This area was a thriving fur trading base for over 70 years before Lord Selkirk established the first permanent settlement, Fort Gibraltar, in 1809. 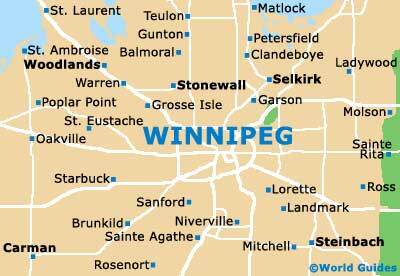 The settlement's name was changed to Fort Garry in 1822 before it officially became the city of Winnipeg in 1873. A reconstructed section of Fort Garry, destroyed during an 1822 flood, today stands near the corner of Broadway Avenue and Main Street. The Red River Rebellion, lasting from 1869 to 1870, is among the most famous and the most controversial events in the history of Winnipeg. Louis Riel led the Métis people, descendants of First Nations women and European fur traders, in a rebellion against the English-speaking governor and settlers from eastern Canada. The Métis feared the English would threaten their farms, French language and Roman Catholic religion. Riel was eventually executed for high treason, an act which deeply divided French- and English-speaking Canadians. Today, two Riel statues stand in Winnipeg and the rebel leader's former home is now a National Historic Site. Shortly after the Red River Rebellion, in 1873, Manitoba became Canada's fifth province, with Winnipeg incorporated as its provincial capital. This was the most prosperous time in Winnipeg's history, and the city grew more rapidly than nearly any other in North America during the late 19th century. Western Canada's first university, the University of Manitoba, was founded in 1877. 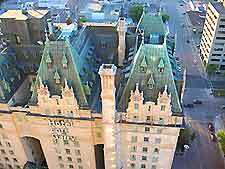 Winnipeg became the hub for the growing population of settlers flocking to Manitoba to farm the surrounding prairie landscape and the crossroads between western and eastern Canada, following the 1881 establishment of the Canadian Pacific Railway. Winnipeg's fortunes began to falter after the 1914 Panama Canal opening, when international trade markets no longer had to rely on Canada's railways. In 1920, Vancouver dethroned Winnipeg as Canada's third-biggest city, a year after its historic General Strike, when over 30,000 labourers protested their working conditions in May 1919. Two strikers lost their lives and over 30 more were injured on Bloody Saturday, the day the strike ended violently on 21 June 1919. One of the strike leaders, JS Woodsworth, helped to establish what would eventually become Canada's left-leaning New Democratic Party in 1932. 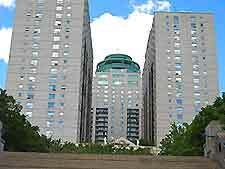 Winnipeg may no longer be a 19th-century economic boomtown, but the city made history in 1972 when it became North America's first urban area to amalgamate several smaller cities into a single metropolitan municipal administration. The most recent celebration happened in 2011, the year the city's professional hockey team returned to Winnipeg after over 15 years in Atlanta, Georgia. What was once the backbone of Winnipeg's economy, the old Canadian National Railway rail yards, is now the city's main meeting place, called the Forks because of its location where the Red and Assiniboine rivers meet. Visitors can now tour the Manitoba Children's Museum, cross the Esplanade Riel into St. Boniface, or browse over 50 shops at Forks Market, in the same location where First Nations tribes and European fur traders once exchanged their wares centuries ago.